We’d love to have you join us for our silver anniversary celebration. 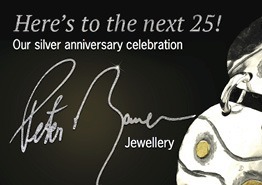 Wear your one-of-a-kind Peter Bauer Jewellery and Peter will help you select a sterling silver keepsake pendant from the crystal bowl. Our gift to you. Peter’s newest collection, Samba, will also be unveiled!